Tour was amazing. All staff were accommodating and we managed to take some unforgettable photos. Loved it you get to see a view of Hong Kong that only a helicopter could accomplish the room I stayed in at he Peninsula was right below the heliport. The only thing I want to note is that the helicopter sits six only 4 seats are by the window so some agreements are going to have to be made prior to getting on the copter. Also weather can play a part it rained two weeks prior but our day was beautiful ! I think they should take pictures of you in front of the copter but due to safety concerns and blades spinning for the next trip it wasn't too safe. It's a must do if in Hong Kong and the weather cooperates . Fantastic view around Hong Kong island. Taking off from and land to Peninsula Hotel roof top heliport is also our unforgettable experience. Temps de vol pas complet 12mn x par six pers a chaque vols , imaginé les heures de vols payés non effectués pour le nombres de personnes qui réserves chez vous ...! 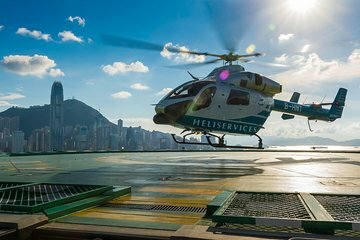 Best way to see the magnificent Hong Kong Skyline!! !